The Panhandle is full of natural wonders, each one putting on its own colorful show. 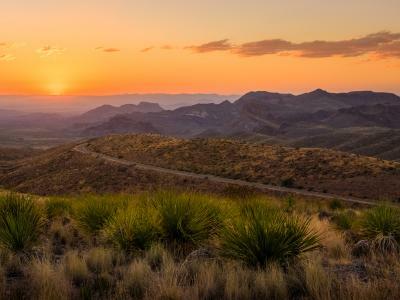 To kick off your trip to this region, lace up your hiking boots for an adventure through the red-banded outdoor wonderland that is Palo Duro Canyon. Known to some as “Texas’ Grand Canyon,” this ancient system reaches 120 miles in length from Canyon to Silverton, measures 20 miles wide and has a depth (in some places) of 800 feet. Providing the vivid bands of sandstone are four geologic layers formed over a million years. 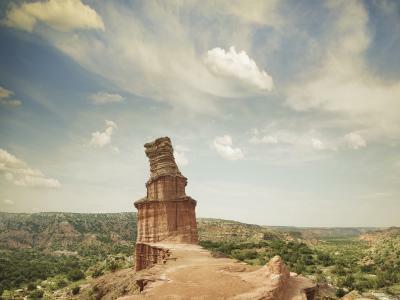 For a really majestic way to take it all in, climb on a horse or mountain bike to ride along the 30 miles of trails at the Palo Duro Canyon State Park. Be sure to take meandering breaks for geocaching and to observe local wildlife. In this area, you can watch for the Texas horned lizard, Palo Duro mouse, wild turkey, mule deer, coyote, bobcat and roadrunner. If you’re a bird-watcher, be on the lookout for golden-fronted woodpeckers, Mississippi kites, Bullock’s orioles, painted buntings and western meadowlarks. Part of the Official State of Texas Longhorn Herd lives in the park. You can find these gentle beasts near the park headquarters. South of Palo Duro, Caprock Canyons State Park & Trailway unfolds along the magnificent Caprock Escarpment. This lengthy, rocky formation pierces the topography and connects the high plains above to the lower plains below. Multihued rock formations can reach as high as 1,000 feet; after rainy periods, the landscape can be carpeted in strips of green, with blankets of wildflowers in spring and summer. The Texas State Bison Herd lives here, roaming some 10,000 acres. The canyons provide homes to deer, coyotes, bobcats, pronghorn antelopes, foxes, raccoons and jackrabbits, while Mexican free-tailed bats roost in the Trailway’s Clarity Tunnel. At Lake Theo, take a dip or try your hand at catching bass, trout or catfish. If the kids are in tow, they’ll love the Junior Ranger program. 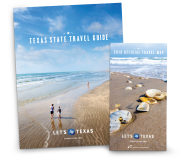 For a respite from the windswept plains, make your way to the Lake Meredith National Recreation Area, an extraordinary lake mingling with the buttes and cliffs of the Canadian River Valley. Formed by damming the Canadian River, this 16,500-acre reservoir is surrounded by 200-foot canyons in ancient shades of russet and cream, providing adventurous souls a playground for waterskiing and fishing, as well as off-road trail riding, hiking, picnicking and camping. Right next door, you can search for wildly colorful flint in the ancient rocks of the Alibates Flint Quarries National Monument. Below the South Plains, you can head east toward Mineral Wells for a canoe trip along the mirror-like Brazos River, paddling through gorgeous scenery in the Palo Pinto Mountains. During autumn, the trees take on every lovely seasonal hue that nature has to offer. This awe-inspiring area is full of natural landmarks big and small, all just waiting for you to get out there and find them.